Are you looking for a creative way to say you love your special person? 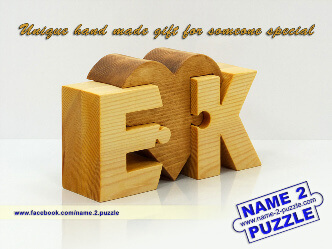 The personalized initials puzzles are perfect gifts for beloved ones with personal touch. 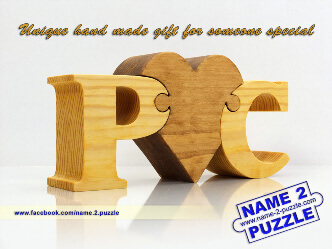 All the personalized puzzles are handmade from one piece of pine wood, sanded and finished with olive oil. 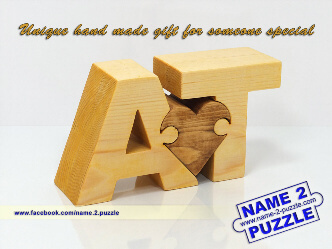 The best part is that the puzzle contains a shaped piece such as a heart or an ampersand “&”, which can vary in size depending on the initials. It is a unique gift with the letter(s) of you and your special person joined by a heart – the symbol of love. 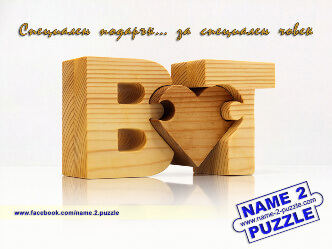 If you wish, you can add a personalized class to your initials puzzles by providing your names and/or a wedding date. They will be placed onto a piece of solid pine wood base and included through a laser engraved metal band. These initials puzzles are a great gift idea to say you love someone on St. Valentine’s Day, any other special day or without any occasion. This is a gift that will be treasured forever! NOTE: We do not have ready to buy initials puzzles. We make them only by order. Dimensions: 17 x 8 x 4 cm. Dimensions: 16 x 8 x 4 cm. Dimensions: 15 x 7 x 4 cm.